Piet Oudolf and his new-wave planting style may be the most innovative approach to gardening today, but this Dutch garden designer and nurseryman is no trendy flash in the pan. His distinctive style – a thoughtful evocation of nature that emphasizes the form, texture and natural harmony of plants – is the result of more than three decades of observing and working with plants, especially perennials. “All my work is related to trying to recreate spontaneous feeling of plants in nature. The idea is not to copy nature, but to give a feeling of nature,” he says. His designs mesh airy ornamental grasses with sculptural perennials in meadow-like associations. The idea is to create interest and drama from early spring through the climax of summer to the austere beauty of the plants dying back in fall. His fame growing internationally, Oudolf has designed public and private gardens in Holland and Germany, Sweden, Britain, and in the United States. His American gardens include Gardens of Remembrance in New York City, for 9/11 at Battery Park in New York City, as well as the planting design of the Lurie Garden at Millennium Park in Chicago. He was also involved in designing gardens for the newly renovated Toronto Botanical Garden building (formerly Civic Garden Centre). At his own famous garden, at Hummelo in the Netherlands, he continues to experiment with perennials. Plants are sold at the property’s nursery, which is operated by his wife, Anja. His interest is in growth and renewal, not just the fleeting perfection summer bloom. He relishes the entire cycle herbaceous plants undergo each season – from the tender shoots re-emerging in spring to flowering, going to seed and dying back. In particular, this talented designer revels in the shapes and forms of seed heads and dried stems, which traditional gardeners are always rushing to cut back each fall. Rather than just flower color, he concentrates on form: flowers in buttons and globes, plumes, spikes, daisies or umbels and what he calls ‘curtains’ – airy see-through plants such as ornamental grasses, meadow rue and bronze fennel that give depth to a planting and emphasize the play of light and motion. “If the structure is right, the garden works. 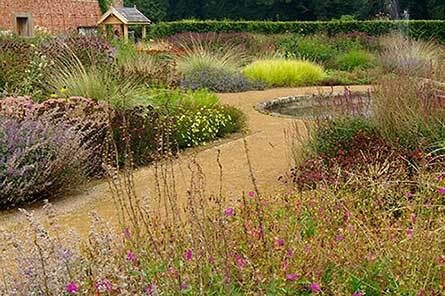 It doesn’t matter what colors you use,” Oudolf stresses. His emphasis on structure includes evergreen and deciduous hedges that create definition and enclosure, but his hedges, while sheared, often undulate and they are used as punctuation marks and to provide sculptural interest to the garden year round. For more information on how to create this look in your own garden, look for Planting Design: Gardens in Time and Space (Timber Press, 2005), written with Noël Kingsbury. The book is an indispensable primer to designing and planning the natural garden. As always, the emphasis on plants that are beautiful, but that don’t need to be pampered or coddled. Visit Piet Oudolf’s website (link opens in a new window).